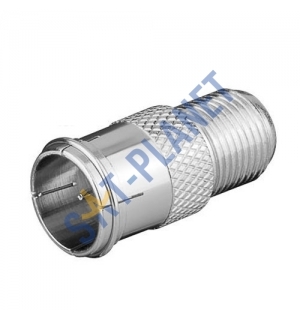 This Quick F connector/adaptor is used when F-terminated coaxial cable is continuously being connected/disconnected. This adaptor converts a normal F twist-on connector to a convenient push-on fit F plug. It's ideal for using with satellite meter/finder and also ideal for the users of portable satellite and terrestrial systems for quick set up (camping, caravaning, motorhome etc.). PLEASE NOTE: Price is for 1 Quick F connector/adaptor. If you need more connectors please enter required quantity in the field avaliable on the top or select from packs options.